The President of Uruguay Tabare Vazquez, in a meeting with the President of FIFA Joseph Blatter, propused him that the MERCOSUR countries will be host for 2030 World Cup, which Blatter described as "a dream that can become a vision, then an initiative and after a project" . The President of the Republic, Tabare Vazquez, received in his residence the President of FIFA, Joseph Blatter, visiting our country with a delegation of soccer personalities, domestic and foreign, representatives of almost all continents. This was described as "a meeting of friends of football, it was alluded the 75 aniversary of the creation of the Centenario Stadium and the first World Cup and was a occasion to talk about the value of football. Blatter reported that Vazquez presented an idea for 2030, the centenary of the first World Cup, that MERCOSUR countries organize World Cup. "For the President is a dream, but a dream can become a vision, a vision after an initiative and after a project," said the President of FIFA. 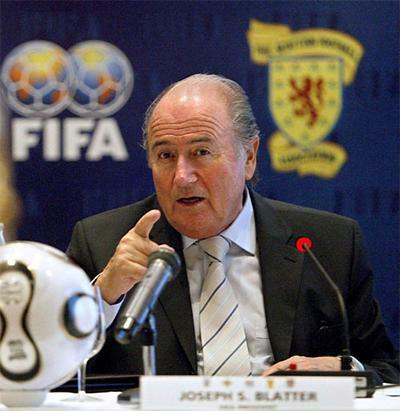 "The 2014 World Cup was awarded to the South American Football Confederation, which means that some national associations could submit an application; Vazquez also confirmed its support to local football," added Blatter. Blatter explained that at the hearing was presented by the 205 national associations, a special plaque to the Oriental Republic of Uruguay, through its President, as well as a film that was made to commemorate the first World Cup and from the Executive Committee by the President of FIFA, a medal commemorating 100 aniversary of that institution.